by Dr Man Singh Nirankari. Azad Hind Store. Page 314. Rs 250. DR Man Singh Nirankari is a world famous eye surgeon. Having graduated in medicine in 1937 from King Edward Medical College, Lahore, he passed his FRCS from Edinburgh and got his DO from London. In this book that has 27 chapters, all equally interesting, the doctor has called this venture of life a Safarnamah, a journey. He traces his lineage from Baba Sahib Dyal. His father was Bhai Hara Singh and Mother Maya Wanti. He was born in 1911 in the village of Meki Dhok, which is in the district of Cambelpur in Pakistan. 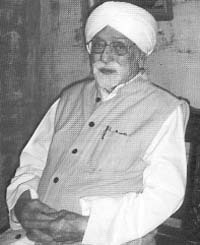 He gives details of his admission to King Edward Medical College, Lahore, and talks about his friendship with Karam Singh Grewal, who was an expert in playing dholak, and later became Head of the Department of Orthopaedics. He has sweet memories of their establishing a gurdwara in the college. He remembers his engagement to Phul, the pretty daughter of Sardar Sant Singh of Lyalpur, a reputed advocate. They got married in 1942 at Lyalpur and later their son, Varinder Singh, settled in USA as Professor in Ophthalmology in Maryland. He also talks fondly of his two daughters, Aruna and Neelam. The latter has made a name for herself for producing and directing plays which appeal to an international audience. During the 1965 India-Pakistan war, Nirankari was Medical Superintendent of medical college hospital. With his friend, Karam Singh Grewal, he formed a band of dedicated doctors, nurses and para-medics who worked round the clock to look after wounded soldiers. His account of the war contains a heart-rending description of Darshan Singh Pheruman‘s fast unto death and ultimately death. Friends always had the good words to describe his actions. One Kulwant Singh Khokhar has been quoted as saying: "Dr Nirankari operates on the patients’ eyes with a rare ambidexterity, on the right eye with hi right hand and on the left eye with his left hand. I have also contributed to this book an article, My Medical College Days. He has given the Punjabi translation of my four-line verse, When I was Single." Of his travels to western countries, he has vivid recollection of his visit to the Vatican City. He was charmed by the sight of the Pope giving an audience to his admirers from the window of the church and taken in by the Christian practice of confessing sins before a priest who sat behind a curtain. The book has spectacular finish. It ends with a poem charged with emotions and aspirations. Man Singh Nirankari has penned his autobiography with a rare penchant for dates, details, descriptions, dialogues and dexterity. The book is well printed, well presented and worth reading. The reviewer is a retired Major-General.